I like pastry. I also like cheese and I would happily barge anyone out of the way to get my hands on a cheese, onion and potato pasty. 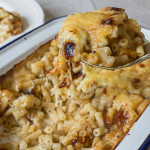 The perfect combination of cheese, potato, onion and pastry can be hard to find and I like chunks of potato and onion not a mush; so I thought I’d best go about making my own version so I can make it just right. 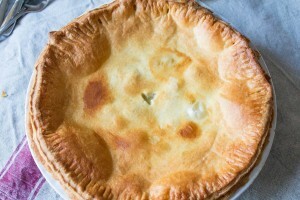 It’s also British Pie Week next week so the timing of my pie baking is ideal. Boil the potatoes and cook for 7-10 minutes or until tender then drain and put to one side. Fry the leeks on a medium heat in a little butter for around 10 minutes, until softened, then add the flour. Cook for a minute then add the milk and stir well while heating to make a thick sauce. Add the potato, cheese, chives and salt and pepper to the cooked leeks. 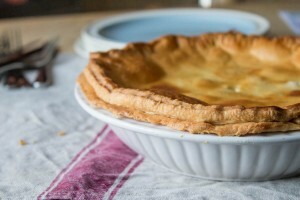 Preheat oven to 180C and lightly grease a pie dish with butter. Take two thirds of the pastry and line the pie dish. Trim any excess pastry, prick the base with a fork, line with greaseproof paper then fill with baking beans or rice and bake for 12-15 minutes then remove the beans and greaseproof and return to the oven for 2 more minutes. Pour the filling into the pastry case. Brush the edge of the pastry base with milk and roll out the remaining pastry. Top the pie with the pastry and press the pastry well onto the pastry base. Trim any excess and brush the top with milk. Cut a slit in the top of the pastry then put back into the oven for 25-30 minutes or until golden brown. 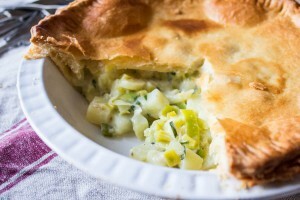 The leeks and chives in this give a brilliant green colour to the pie so it’s not all beige. I liked that the filling wasn’t too wet and stodgy but you could clearly see and feel the potato and leek. Comfort food is always welcome, particularly when it’s mostly carbohydrate based and this was my perfect dinner on a rainy evening this week. Not only exactly what I wanted but also a bargain for four people. You could of course make your own pastry but when I’m as busy as I am now, readymade and rolled is my best friend. This leek, cheese and potato pie sure sounds good! I love the combo of flavours. Looks so yummy! 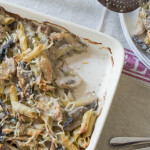 Great dish for the weekend. 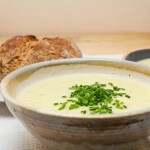 Oh yum, I have some leeks in the garden to use up. I might do this as pasty form & split the recipe in two, normal cheese for me & lactose free stuff for Mike . I’m with you on the texture thing. Commercially-made pies are often filled with unidentifiable grey matter. So-called “Cornish pasties” are the worst! I’m not a big fan of pastries but I love the potato cheesy filling. Its so good on its own. This is a cheap and very tasty dish. I love also the fact that is meat free. I find that we eat lots of meat in the winter and it is nice to try tasty vegetarian dishes instead. I love pies! Lovely pie! I so rarely make this kind of dish, and keep thinking I should do it more often, because I always enjoy it. This looks wonderful — thanks. What a lovely bountiful supper for so little money—you go girl! Needs a smoked pork product. Otherwise, sounds good. What a perfect combination of flavours! I’d love to try this pie. This looks amazing!!! I can’t believe how cheap it is too! those horrible cheese and onion pies at tescos are one of my guilty pleasures so I am going to have to have a go at this fantastic homemade leek pie! I think this looks delicious. I like these frugal meals. Leeks and potatoes go so perfectly together, too.